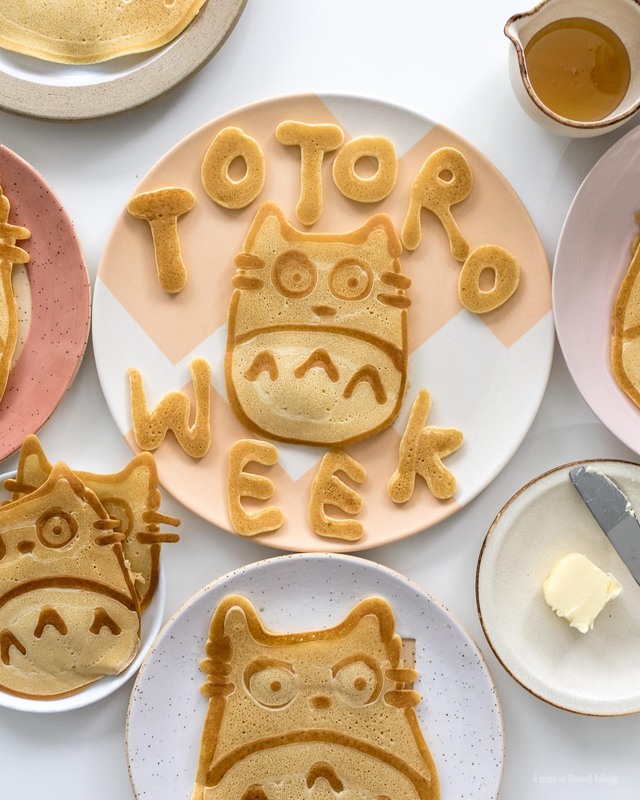 I’m back for another day in Totoro Week with some super easy Totoro pancake art! 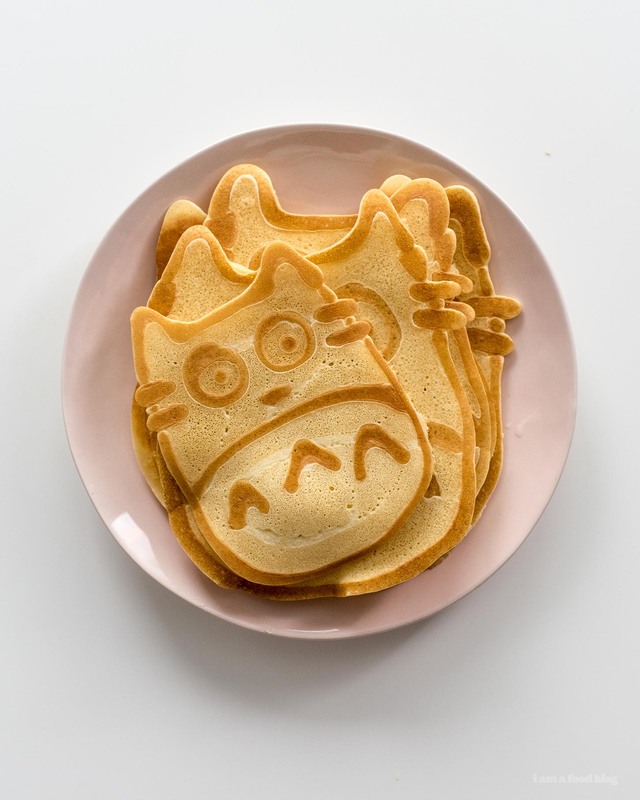 I’ve made Totoro pancakes before but never pancake art style. 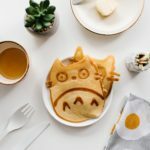 What’s pancake art you ask? Well, it’s when crazy talented artists make multiple colors of pancake mix and then draw on a pan or griddle. It’s INSANE. I’ve devoted way too much of my life to watching pancake art videos on YouTube. I’m not nearly as talented as those peeps, but a simple Totoro I can do. And so can you! Let me break it down for you. You need: pancake mix, a squeeze bottle, a non-stick frying pan/griddle, and butter for your pan. I used my all time favorite crepe maker for these guys and it was so easy because I didn’t have to think about keeping the heat even. I actually use the crepe maker quite often, not just for crepes, but for pancakes and other things that generally need low heat. But, that being said, these pancakes will totally work in a pan too. Make some pancake mix. I actually went ahead and used some Aunt Jemima’s. I was going to make pancakes from scratch but Mike suggested Aunt Jemima’s and I kinda had a craving for childhood, so I went with it. Pro tip: make your pancake batter in a giant liquid measuring cup. I used this one and it was awesome because it made it so much easier to do step 2. Pour the pancake mix into a squeeze bottle. If you can, try to find a squeeze bottle with a smaller opening. It’s not a huge deal, but it’s easier to get the details right when your pancake lines aren’t huge. Also, don’t fill your squeeze bottle all the way because the mix might expand and then you’ll have a pancake explosion on your hands…it happened to me. Heat up your pan over medium heat and melt some butter, if you’re worried about the non-stick aspect of your pan. I didn’t really use butter because the crepe maker I use is so awesome, but if you need butter to help with non-stickness, do what you gotta do. Pipe out a Totoro: whiskers, then ears and body, then eyeballs, then circles around his eyes, then his nose, his chest, and chest furries. Let brown. Turn the heat down to low and then fill in all the spaces. When the batter starts to bubble (just the same as regular pancakes), flip him and cook the other side. Done! Totoro cuteness unlocked! Repeat as needed. By the way, it took a while to figure out the right way to do this. I started off by making his eyes first, then his nose and body, adding the whiskers in last, but he looked kind of weird. I couldn’t figure out what was wrong, but then Mike suggested that I make his whiskers first. He came out perfect! Apparently that’s just simple drawing technique, knowing what you want in the foreground. Shrug. I’m just happy I had a stack of golden brown pancakes all ready to drown in syrup. I’m keep the theme with easy Totoro tutorials, so I hope you give these guys a try. I’ve got one last Totoro up my sleeve so keep an eye out for him! PS – In my continuing saga concerning The Haunting of Hill House: I finished watching the end of episode 2 (the one that our friend Betty couldn’t finish). But I basically was watching it through my fingers because I was so scared. I couldn’t watch any more episodes but I desperately wanted to know what happened so I decided to read synopsizes instead. So I read all of the synopsizes. They scared me too!! I had to shower with the door open and my dreams last night were a little disturbed. You’ve been warned, don’t do it!